This frame let you create appealing visual styles to your applications in all Windows versions. All new default styles (XP, XP dark, Vista, Office 2003 and Media Player 10) and themes are supported (blue, olive, silver, royal). 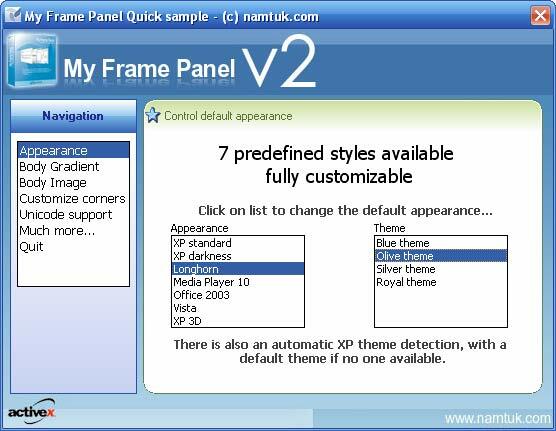 My Frame Panel ActiveX enables you to customize the appearance of your applications to suit your individual needs.Source Code available for purchase. * Display frame in 5 predefined styles (XP, XP dark, Longhorn, Office 2003 and Media Player 10). * Default Theme options for all Windows versions: automatic, blue, olive, silver, default. * Define a background image and position it as you want. * Body gradient with Full color and position customization. * Header gradient with customization like body. * Text position and effect like shadowed, engraved, emboss. * 4 rounded independant corners with radius value. Add impressive frames to digital photos, desktop wallpapers or website images! Qweas is providing links to My Frame Panel ActiveX 2.01 as a courtesy, and makes no representations regarding My Frame Panel ActiveX or any other applications or any information related thereto. Any questions, complaints or claims regarding this application My Frame Panel ActiveX 2.01 must be directed to the appropriate software vendor. You may click the publisher link of My Frame Panel ActiveX on the top of this page to get more details about the vendor.